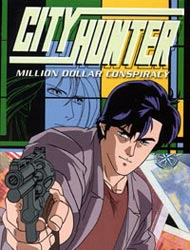 Watch City Hunter: Million Dollar Conspiracy full episodes online English Dub. Synopsis :Beautiful American Emily O’Hara offers the City Hunter (Ryo Saeba & Kaori Makimura) one million dollars to protect her from a man named Douglas. Ryo & Kaori take the job, but things are not quite what they seem. The real target just might be Ryo, but it’s unclear who wants Saeba dead.